Microsoft revealed that they'll enter the tablet space directly with their new tablet, the Microsoft Surface. But, that doesn't mean they'll abandon or neglect their existing hardware partners, Microsoft CEO Steve Ballmer said in a published report after he left the stage at yesterday's press conference. Ballmer said that while the Surface is an "important companion" to Windows 8, it's "not the only piece." 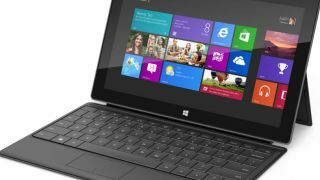 TechRadar speculated after yesterday's announcement that Microsoft's PC hardware partners might not be too happy that the company is taking the Windows 8 tablet business into their own hands. But Microsoft even warned their partners ahead of time that they were developing their own tablet. "Our PC partners knew in advance we were announcing something today in this space," Ballmer said. He replied with a "no comment," however, when asked how Microsoft's partners felt about it. "It was always clear that what our software could do would require us to push hardware, sometimes where our partners hadn't envisioned," Ballmer said on stage as he revealed the Microsoft Surface. The tablet weighs 1.5 lbs and sports a 10.6-inch Gorilla Glass display, edges beveled at 22 degrees, a 9.33mm magnesium case, USB 2.0 and DisplayPort for high resolution displays. Its full keyboard-equipped magnetic cover impressed TechRadar, and the Intel version that will ship months after the less-powerful ARM version will run a full desktop edition of Windows 8. But Ballmer pointed out that most PCs sold next year will still come from Microsoft's partners and competitors. "If you look at the bulk of the 375 million machines that get sold (next year), they probably aren't going to be Surfaces," he said. "On the other hand," he added, "we could have a sizeable business."